Like many other places around the country, we are already experiencing beach weather and the kids have been spending most of their time (outside of school) playing outdoors–including in pools. These basics will help keep your skin moisturized, protected and nourished without breaking the bank! First, a word about sunscreen. With skin cancer rates on a dramatic rise, it’s more important than ever to protect ourselves–especially our children–from the sun’s damaging rays. Did you know skin cancer is the most common form of cancer in the United States? And each year there are more new cases of skin cancer than the combined incidence of cancers of the breast, prostate, lung and colon. In fact, 1 in 5 of us is expected to get skin cancer. Burn Out sunscreen ($13) continues to be my favorite for the third year in a row. It’s light, lotion-like consistency makes it easy to spread, and of course, it’s SPF 35 and mineral-based, not chemical, using only zinc-oxide (18.6%) in a non-nano form which has zero “casper” effect. It comes in three formulations, KIDS, Ocean Safe and Sensitive. They’re all great and vary only a little in formulation. I use Burnout on my face and body, but if you want something specially made for the face, try one of the BB creams below. Beauty Balms are all the rage now, and I searched and tested high and low to find a natural BB product I liked. 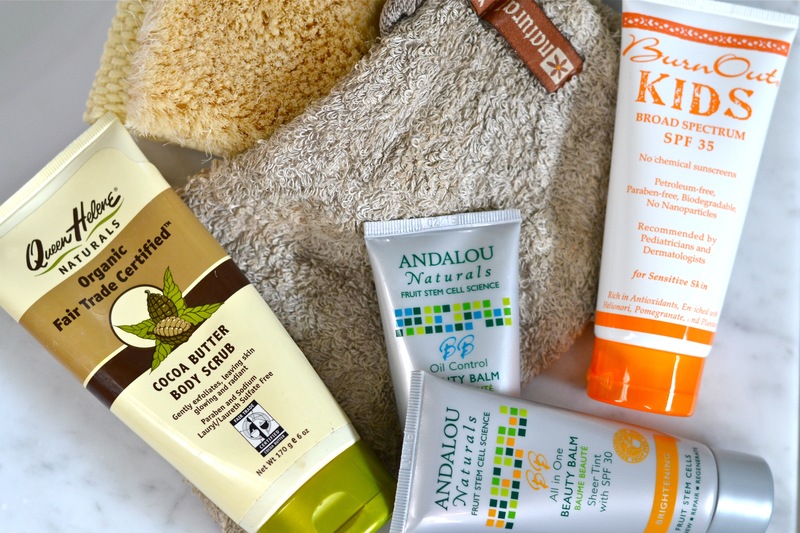 Andalou Naturals came out on top, and I’ve been using it daily for over a year. In addition to an impressive list of ingredients, this cream is also SPF 30, and uses only non-nano zinc-oxide. It comes in two formulations–a beautiful moisturizing sheer tint which is yellow-based instead of the weird peachy-pink hues you usually find, and a moisturizing but oil-controlling formulation. Both are excellent products and smell wonderful! Get your skin glowing for beach weather by sloughing off the dead skin cells from winter. A body brush feels invigorating and when used in quick, light strokes helps your lymphatic system function properly. If your skin is more sensitive, use a natural loofah mitt or delicious-smelling body scrub. My favorite is the Cocoa Butter Body Scrub by Queen Helene Naturals. It leaves my skin soft and silky smooth, and it’s a bargain at $7 a tube! You can also make your own scrub at home by mixing 1/2 cup evaporated cane juice with 2 tbsp coconut oil and 1 tbsp honey. Three additional items to have on hand this summer include aloe, coconut oil and a good hat. Aloe plants are drought-resistant, easy to grow and the juice treats any number of ailments including sunburn, rashes, insect stings and dry skin. Coconut oil is an excellent, incredibly inexpensive moisturizer with anti-microbial properties. I cook with it regularly, but I also keep a little bowl of it near the kitchen sink to quickly moisturize dry hands. As for the hat, shielding your skin from the sun’s rays with clothing that has an SPF 50 or higher is the best protection against skin cancer and premature aging. Whether it’s a floppy beach hat, a smart-looking fedora or a baseball cap–anything is better than nothing!